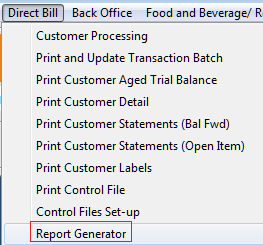 The Report Generator will allow you to print customer lists based on specified parameters. Any fields in the Customer setup screen may be used. 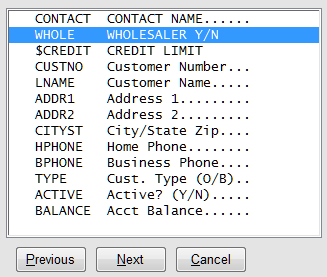 There are default built-in fields such as Customer Code, Customer Name, etc. Additional fields may be added through the Data Dictionary in Control Files Setup. A variety of fields may be set up, such as dollar amounts (credit limit for example); alpha fields such as Y or N; Informational alpha fields, and numeric fields. From the City Ledger or Direct Bill menu select "Report Generator". When the Report Generator screen opens, you will be at a series of prompts. Answer the prompts as appropriate and then press Enter. The first prompt is Report Name. This is a one-word name that you will use next time you want to print this same report. In the example below the name is WHOL. The next prompt is Title. The Title of our sample report is WHOLESALERS. Next you will see a prompt (S)elect (P)rint (E)nd. You will start with S. You will select the parameter for selecting customers. In our example below we are going to select wholesalers. To achieve this, we set up a Data Dictionary definition for wholesalers which placed a field in the Customer Setup screen FOR "WHOLESALER Y/N". The customers with "Y" in the "WHOLESALER Y/N?" field will be included in this report following the parameters you will see as we go. You can sort by any parameter you wish. The SELECT parameters 9r conditions include greater than, less than, equal to, and not equal to. Below, S was typed. The next prompt is for the item, or type L for a list of items. In this case, L was typed. The list of items displays. WHOLE is selected. Next is the prompt. For Equal to, you will type E.
A value was prompted, and Y was entered as the value. This is what will include all customers with "Y" in the WHOLESALERS Y/N" field in the customer setup. Next, Condition 2 is prompted. If appropriate, enter another condition. For example, if you had chosen ZIP code as the SELECT item you might put the first condition as greater than 32000 and you might put the second condition as less than 32999, which would include all customers with ZIP codes between 32000 and 32999. When you are finished entering the conditions and values, press Enter. You will see the (S)elect (P)rint (E)nd prompt again. You may select additional items for the customers to be included in this report. If you have finished with the selection, type P. P will allow you to print the information that you would like on the report. When you type P and press Enter you will see a new prompt. Type N to exclude the page header. Type S to skip to the next print line if you wish. Press Enter to continue. Type the item to print or type L to display a list from which to select your print items. You may select multiple columns, but you must select them one at a time. A prompt will ask if this is a sort key. If you answer Y, then the report will sort by this parameter, whether alpha or numerical order. If you answer Y to "is this a sort key?" a prompt will ask if this is primary or secondary. The prompt will return to (S)elect (P)rint (E)nd. 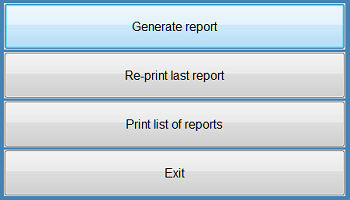 Continue typing P to add items (columns) to print on the report. When you are finished, type E.
When you type E to end, a popup will ask if all of the information is correct. 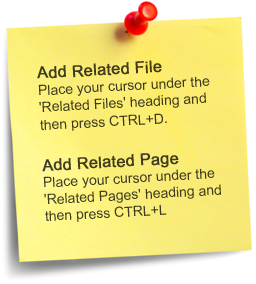 A popup will allow you to display the information on screen or print it. If you display first you will be able to print from there. Below is a report based on the parameters selected.